I run Surf, Yoga, and Adventure retreats for women primarily in Nicaragua, but also sometimes El Salvador, Costa Rica, and other awesome interesting locations around the world. 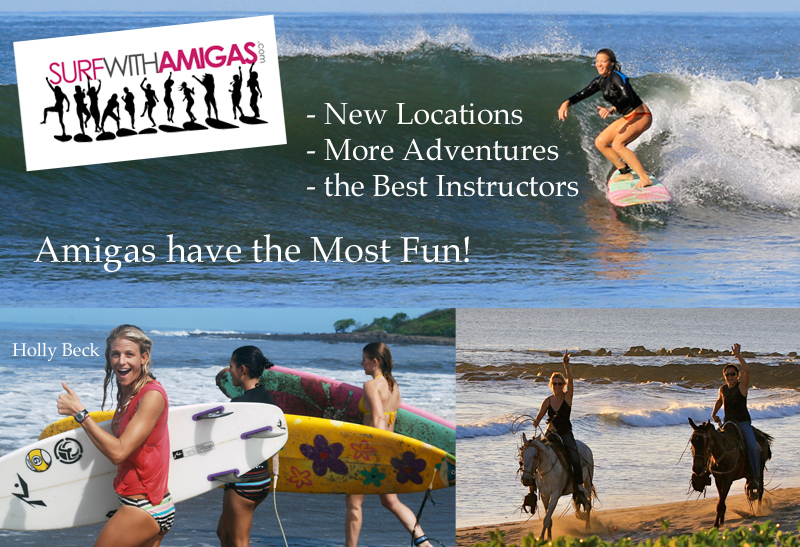 We specialize in providing you a hassle-free, but adventure-heavy experience where you can learn to surf or improve your existing skills, do yoga, interact with the local community in a positive way, and push beyond your comfort level to come away feeling energized, inspired, and empowered. Holly, this is a great idea you came up with! i hope it beomes a great success! Sweet life…..Are there co-ed trips? hey Jake, yeah! which trip interested you most? I can’t help but smile, I’m all about the “giving back”. When’s the next Nico trip and can boys play? We haven’t shared a surf since the NSSA days, good times from what I remember (besides having my behind handed to me on several occasions LOL). I came upon this watching a show on hgtv ….and i so totally fell in love…I really want to learn to surf…where can i sign up? go to http://www.surfwithhollybeck.com for more info! Would love to put together a surf trip with some ladies in my area. That boat trip to Fiji is a definite with my husband when my young boys are a little older! Maybe Nicaragua next winter (2011-12) if you have any dates – please add me to your email list. Also, let me know the minimum number of participants you need to run a camp down there – thanks! The nicaragua trip looks amazing!! Do you have any more dates available? Do you have to have prior surf experience? no prior surf experience required. check http://www.surfwithhollybeck.com for more details! I have always loved your websites and all websites your affiliated with, your truly a vibrant inspiration to all people and a legend to a fellow la county surfer . Just found this site, I am a RPCV (Returned Peace Corps Volunteer) who served in El Salvador from 1998-2000. Looks very interesting and will share this site with other El Sal RPCVs.